Meeting twice a week, on Tuesday morning and Thursday afternoon, a group of women come together to create craft items for the Mission Gift Shop. Using their imagination, they devise a variety of seasonable gifts to catch the eye of visitors. 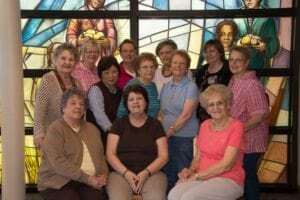 The money the women raise helps support the Sisters of the Blessed Sacrament. With the World Meeting of Families coming up and the Mission Center being a place to visit, the Craft Volunteers work double time to get items ready for the Mission Shop. 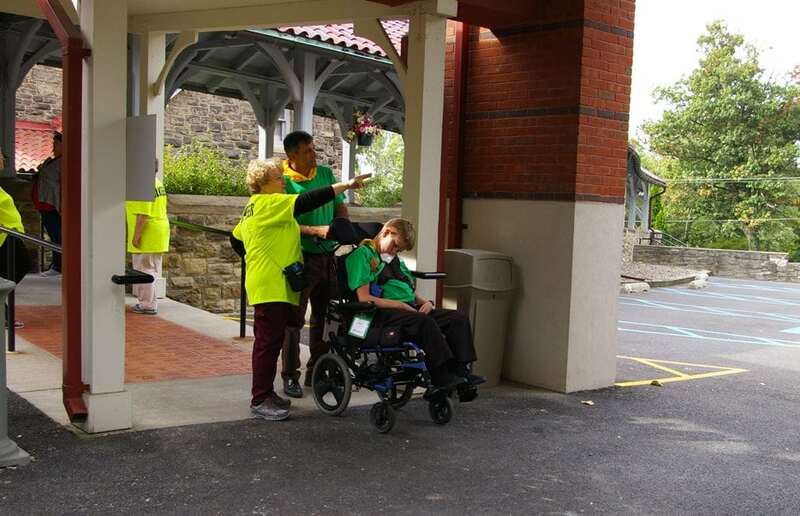 Bobbie Miehle, Connie Mulhollan and Teresa Kmiec each employ different skills. Several of the volunteers have been involved for many years. They started out working in a ground level room with Sr. Mary Catherine Schwegler. Later, when age incapacitated her, they found a new home for their ministry on the third floor of the Mission Center. Since the Gift Shop is on the first floor, carrying their creations to the shop is much easier, especially with the help of the elevator. Why do they come week after week, year after year? Mena Dittart started out doing ceramics at home. 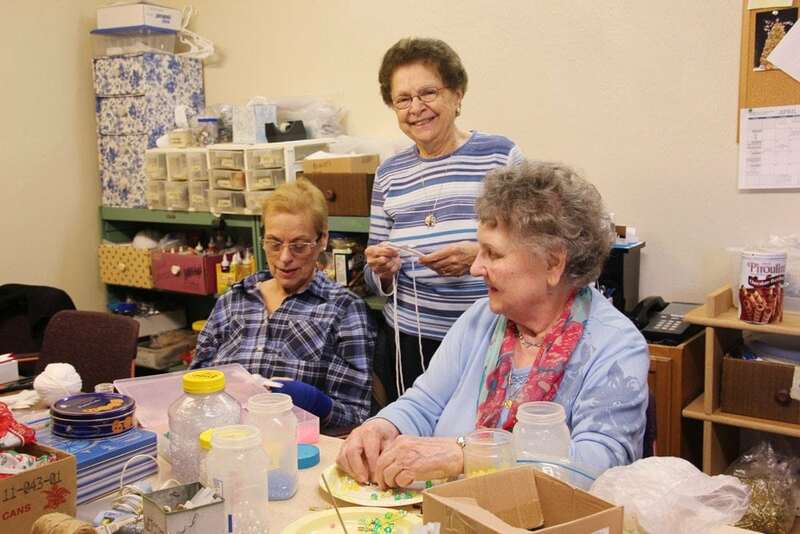 Being a craft volunteer gave her a chance to give back to the Sisters of the Blessed Sacrament. Mary Troki likes working with her hands and using that giftedness to help the community. When the volunteers meet she feels a sense of peace, contentment and accomplishment. 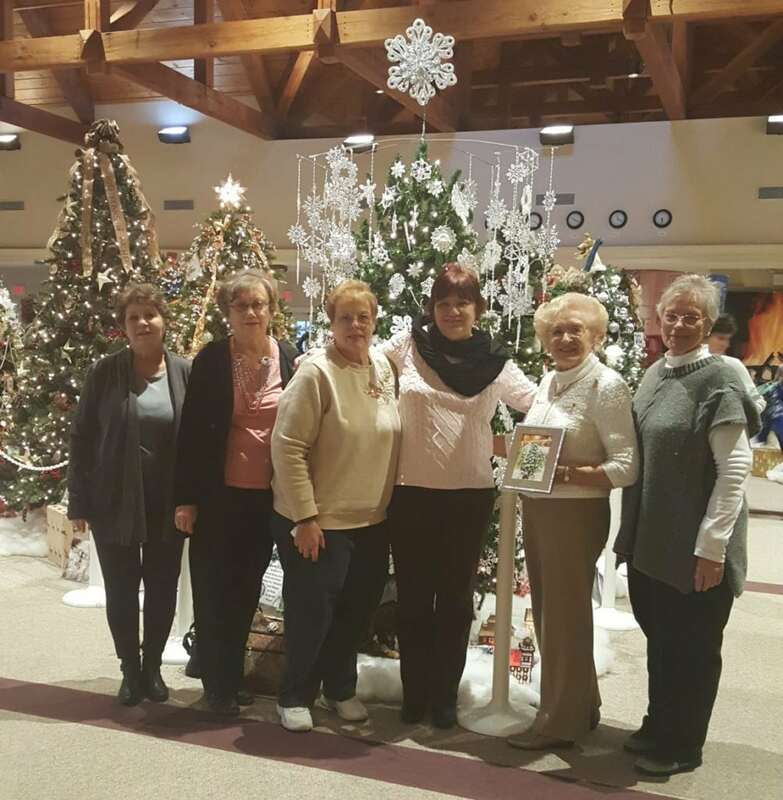 Receiving 2nd place honors in 2017 for their entry into the Bucks County Tree Fest, the Crafty Ladies represent the Shrine of St Katharine Drexel in this annual competition. These talented ladies are multi-year winners for their creatively themed trees that are always so beautifully executed. The public vote determines the winners. Congrats to them for another great entry! Although the women have different faiths, Mary and Mena agree that they pray to the same God, share a belief in God. Their enjoyment of each other is attested to by their laughter and chatter as they work together. 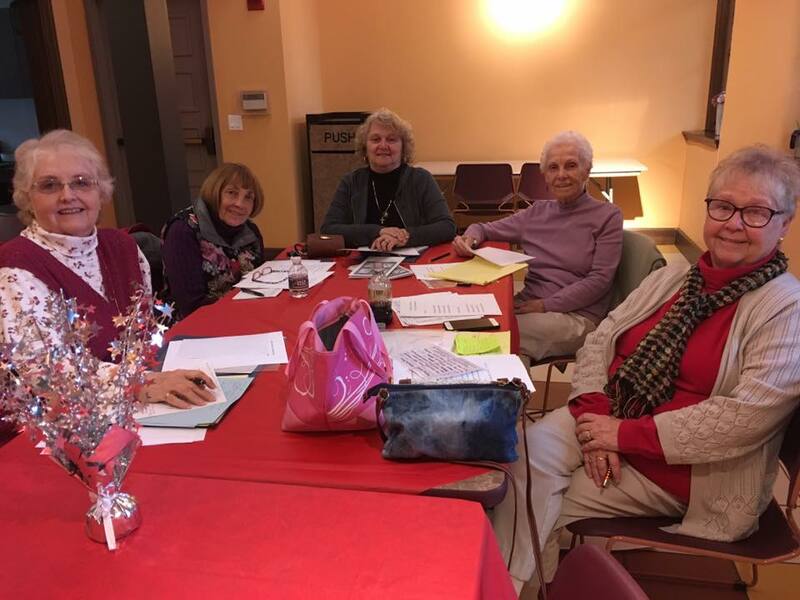 Pictured left to right, 2017 Honor Gaurd Committee: Terry, Maureen, Rosemarie, Monica and Ruthie, who volunteer their service so graciously to the Shrine of St. Katharine Drexel. 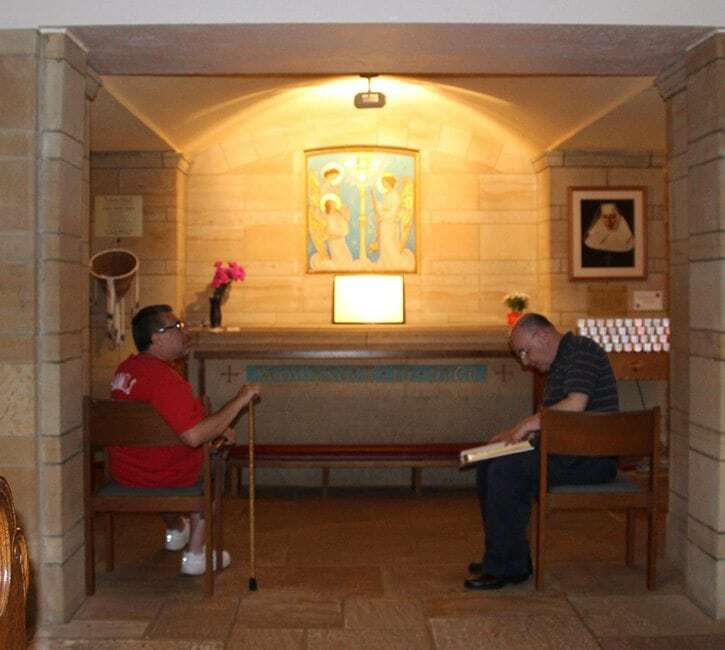 Since 1990 Honor Guards have been quietly making visitors to the National Shrine Chapel and Crypt realize they have come to a safe and peaceful place to pray. Today there are about 60 men and women who commit themselves to spending an hour a week in the Shrine. A few Sisters from St. Michael Residence who are physically able also volunteer as Honor Guards. From one to three Guards are on hand each hour the Shrine is open. Half their time is spent praying before the Blessed Sacrament in the Chapel, the other half praying in the crypt near the tomb of St. Katharine. When visitors come in to pray in the chapel or at St. Katharine Drexels’s tomb, they will see an Honor Guard praying quietly. Unless persons have questions, the Honor Guard respects their privacy and does not approach. 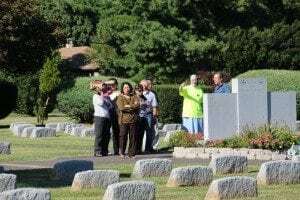 However, when people inquire about St. Katharine or the Sisters, the Guard will give them a brief history of the Sisters of the Blessed Sacrament and their foundress. Sometimes the person kneeling becomes emotionally upset. Tissues are at the ready and the Guard may offer comfort, and if asked, pray with the person. The Honor Guards’ aim is to be unobtrusive and assure a comfortable atmosphere for prayer. 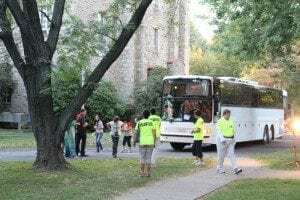 During the World Meeting of Families the National Shrine of St. Katharine Drexel attracted more than 200 large busloads of people. Thousands visited the Motherhouse grounds, the Mission Center and Shrine. With the help of 200 volunteers wearing chartreuse shirts everything went smoothly even when one bus was scheduled and six buses arrived and 50 persons poured out of each. The Shrine was open from 8 a.m. until 8 p.m. from Sunday 9/20/15 until 9/27/15. Volunteers’ shifts were four hours, but many stayed the entire day and day after day! Good things are happening all over! Our latest, 32 pg. issue is packed full of stories and photos. Good things are happening all over! Click this link to view our new page featuring the current and some past issues of Mission Magazine. * Sr. Sandra Smithson’s Charter School welcome’s Nashville’s poor, under-served children. * Sr. Marianne Poole adjusts from being Harlem principal to assisting in a rural school. * Rosalia Badhorse, a Northern Cherokee from MT, wins La Salle Business School Award. * Dr. Norman C. Francis closes 47-year-role as Xavier University’s President. * Carmen Bermudez receives 2015 St. Katharine Drexel Justice Award. * Most Rev. Ferdinand J. Cheri, OFM is ordained new Auxiliary Bishop of New Orleans.